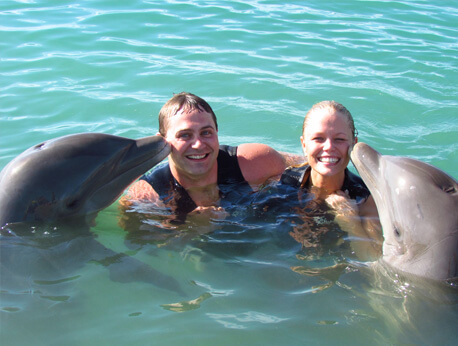 This tour offers our most interactive experience with the dolphins. You will spend a full hour in the water as you give the dolphins a hug, kiss, handshake, and two special tricks. Continental breakfast, lunch buffet, open bar, and pool access all included. Adults and children welcome. Are you looking for an unforgettable adventure on your vacation that can be fun for the whole group? The VIP Dolphin Royal Swim Program offered by Dolphin Discovery is the perfect option for a full day's getaway. Nothing will be as memorable as spending a day at sea with these majestic and friendly creatures. With the VIP package, you will receive the most intimate experience possible with the dolphins throughout your hour-long tour with them. This is a hands-on experience in which you are allowed to nuzzle up closely to these amiable mammals that embrace human interaction. They have plenty of hugs, kisses, and handshakes to go around! However, being cozy with them is only a portion of the experience. Our dolphins love putting on a show, and they want you to be a part of it! The foot push is the most famous trick our dolphins are eager to perform. With your enthusiastic assistance, two dolphins lift you out of the water by the soles of your feet! You've probably heard of horseback riding but have you heard of dolphin riding? The dolphin tow allows you to hang on to the dorsal fins of two dolphins as they glide you across the beautiful Caribbean Sea! After your action-packed adventure with the dolphins, take time to relax and replenish at the Beach Club, where you, as a VIP, will experience ultimate service and luxury. Continental breakfast, a national open bar, and a lunch buffet are all included in the package pricing, so indulge in a tasty feast of salmon, steak, shrimp, sushi, and other international cuisines. After, you can lay out in a lounge chair by the panoramic pool as you enjoy the beautiful views and a tasty tropical drink! However, if you’d like the adventures to continue, your package includes access to park equipment such as bicycles, kayaks, snorkel equipment, and lifejackets. You can even further enhance your experience by participating in the zip line admission your tour includes. 6-9 year old children can swim with a paid adult. 10+ year olds over 4'7" can swim on their own. For safety reasons, pregnant women (5 months and later) can't participate in any of our swim aquatic programs. Wearing life jacket during any water program is mandatory.